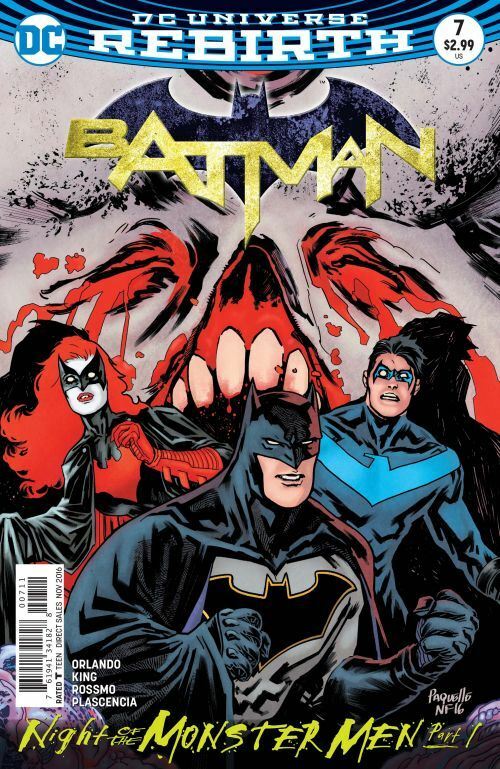 Batman #7 contains the first chapter of Night of the Monster Men, a story that sees Batman and his crew dealing with big emotions, and even bigger monsters. The tale takes place immediately after the death of Tim Drake, in the last issue of Detective Comics, and the various heroes of Gotham are still processing their loss. It’s a wise moment for the villain to strike, and also for the writer to set the tale. None of the heroes are acting on the top of their game, no matter how much they might want to. Hugo Strange is the mastermind behind the Monster Men. Orlando delves far back into Hugo Strange’s repertoire for this notion. Strange had created an army of monsters to attack Gotham as far back as Batman #1 in 1940. There are a lot of different facets to Hugo Strange, and his scientific expertise makes him as deadly as his psychological knowledge. BD Wong did a great job with the character in the second season of “Gotham, “ so I am glad to see the character being used well here. Riley Rossmo presents only one monster in this issue, although we see that four people get transformed. The creature who is the menace in this issue is almost ludicrous, but the absurd elements just serve to make it more terrifying. Batman summons his crew, Batwoman, Nightwing, Orphan, Spoiler and Clayface, and gives each specific duties, while he faces off for some really well drawn action against the monster. Though the other heroes get small roles, they are tidily and effectively characterized, and I am consistently enjoying watching Clayface using his powers for good, and challenging their limits. The story continues in Nightwing #5.